You'll Never Guess Who's Having A Kid! 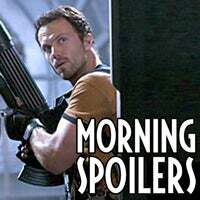 One of the movies or shows covered in this morning's spoiler roundup includes a surprising character having a kid. Is it one of the stars of Star Trek? Or maybe we find out that Jason Statham's scowling race-car driver in Death Race has a baby? Or it could be part of our insane motherlode of Heroes spoilers, including set pics. Maybe the infant appears in one of our preview clips from this week's episodes of Eureka and Stargate Atlantis. Or it could be part of our hints from Lost and Sarah Connor. Click through for the truth about the surprising parenthood of one iconic scifi character. Spoilers ahead! Star Trek: Spock actor Leonard Nimoy once again decided that the needs of the many (to get some spoilers) outweigh the needs of the few (J.J. Abrams and the other makers of Star Trek). Nimoy told a reporter that he and Zachary Quinto have "a scene together," and it's "quite special. We meet coincidentally in a time crossover." It's only a sentence and a half, but it's full of interesting stuff. First of all, it sounds pretty specific: Nimoy and Quinto only have one scene together, not a whole bunch of scenes where the two Spocks team up as some have suggested. Second, Nimoy confirms that the movie's plot does involve time travel. At least, I'm pretty sure that's what he means by "time crossover." [USA Today] Death Race: Here's a new clip and a TV spot from the killer-convict car movie Death Race. Honestly, my main feeling after watching these clips is that I can't wait for Crank 2. Death Race is just to tide us over until we get more Chev. Also, there's a clip showing Tyrese being mean to his navigator here. Lost: The first episode of Lost's fifth season will be called "Because You Left." [EW] Stargate Atlantis: And here's a clip from Friday's Stargate Atlantis, featuring the return of the Replicators. Sarah Connor Chronicles: As we hinted before, Cameron (Summer Glau) will end up in a "halfway house" after she survives that car-bomb blast. And when John finally catches up to her, she won't recognize him. Instead, she'll throw him up against a wall. [E! Online again] Additional reporting by Lauren Davis.